First of all, it tastes phenomenal. If you like the wonderful flavour and aroma of truffles then you will absolutely love this recipe. I’ve been spreading it on toast, crackers, and throwing it in my salads. Secondly, it’s simple to make. It consists mostly of raw cashews and natural flavors. All you need to do is blend the ingredients together and allow it to set in cheesecloth. Lastly, it looks impressive. Not many know you can make a wheel of cheese out of cashews. It’s the perfect recipe to bring to a holiday party to impress your family, coworkers and friends. Even those who turn their noses up to nut-cheeses will be fascinated. The recipe requires the cheese to set in the fridge for a minimum of 8 hours. I do recommend waiting a whole 24 hours or longer because it allows the outside of the cheese to dry out giving it a more authentic cheese look. In regards to cheese molds, I found a rounded bottom 1 cup measuring cup to work beautifully. Other ideas for cheese molds are short plastic cups, small bowls, or ramekins. As long as the mold holds 1 cup of mixture and not much more it should work well. If you don’t want to bother with a mold then you can just form a disc with cheesecloth! 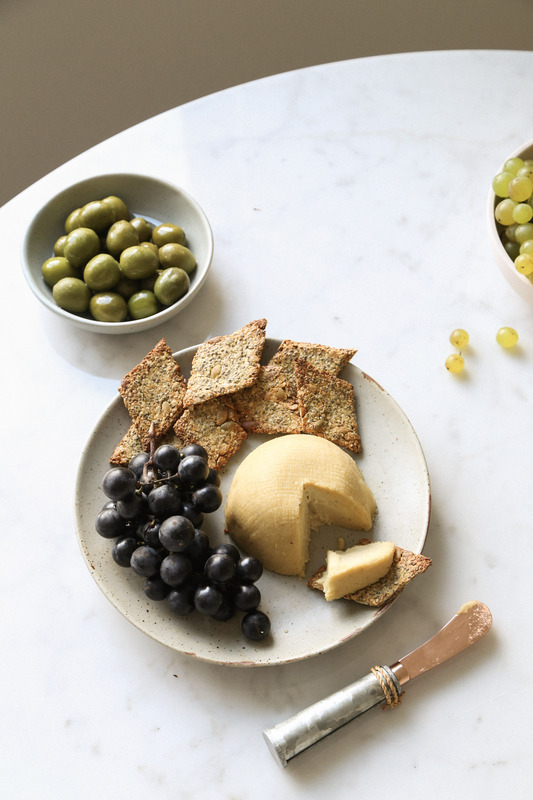 I paired this recipe with my ‘Cheeze’ Seed Crackers recipe but omitted the smoked paprika. Find the recipe here. Adapted from Vegan Holiday Cooking from Candle Cafe (Ten Speed) by Joy Pierson and Easy Garlic and Herb Vegan Cheese by Minimalist Baker. Soak the cashews in water overnight or for at least 6 hours. Drain and rinse before using. With a food processor or an immersion blender, blend together all of the ingredients until very smooth. Add a tsp of water at a time if mixture is too dry to blend. Line a mold* with two layers of cheesecloth and allow some overhang. Place the cheese mixture into the lined mold, allowing the top to be exposed. Place in the fridge for 2 hours or until outside of cheese has firmed up a little bit. Gently remove the cheese from the mold using the cheese cloth as handles and then cover exposed top with extra hanging cheesecloth. Flip the cheese so the top if now the bottom and place in the fridge for 6-22 hours. Place all of the cheese into two layers of cheesecloth. Gather the ends and twist to form a disc. Tie the top with an elastic band and place on a plate. Allow to set in fridge for 6-22 hours. Remove cheesecloth and serve with crackers! * I used two different molds when testing this recipe. I used both a short plastic cup and a 1 cup measuring cup with a rounded bottom. Look around your kitchen and get creative! This entry was posted in Starters/Sides and tagged cashews, cheese plate, holidays, nut cheese, nutritional yeast, party, starter, truffle oil, Vegan, vegan cheese. Bookmark the permalink.